There is no better or faster way to escape from the busy, noisy and hot centre of Sofia than to have a break at Villa Rosiche! If we were to create an illustrated dictionary, we would definitely use Villa Rosiche's photos for the definition of 'boutique patisserie'. It is small, vintage, romantic and cozy. Every time you enter the tunnel leading to this beautiful Villa and its garden, it feels like jumping into a fairy tale! Villa Rosiche is a small town house with a pleasant shady garden with green plants and flowers. It is really nice in the early summer mornings when the air is still cool and there is the smell of fresh and green and coffee. It is quiet and cozy in the evenings if you do not want to sit inside or if you crave some fresh air. The house has been cleverly redecorated and modernised and is furnished with small wooden tables and chairs. The second floor is very cozy and is a perfect place for a private party or a hideout from the hustle and bustle of the outside world. You'll love the delightful cakes, sweets, mousses and creams or the salty croissants - everything is handmade and freshly prepared in the house! The lemonade goes with everything, but you can always choose from the variety of gourmet coffee drinks or the fine selection of teas. You will also find syrups and vishnovka (special local sour cherry liquor). Our favourite dessert? Impossible to choose...The cheesecake? The chocolate mousse cake? Go and try them all! And have in mind that you can bring your pet along! 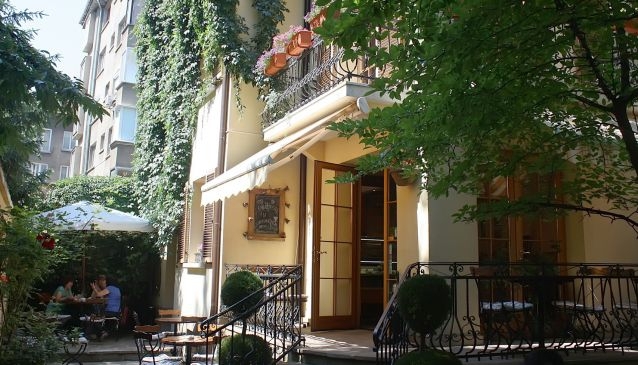 Located just off Vitoshka Boulevard, Villa Rosiche can be a refreshing stop in the middle of an arduous shopping trip or a quiet place to meet with friends and business partners - there are many hotels and offices close by and most of the tourist attractions are a stone's throw away. Villa Rosiche accepts outside orders and there is a menu in English too.